This Hendrix model might just turn everything you think you want from a Stratocaster on its head. Iconic. Fantastic bridge. Dream to play. Difficult to reach the tuners. South paw Jimi Hendrix created a legend when he flipped over a right-handed Fender Stratocaster, switched the strings round and then went about the business of becoming the greatest guitarist of all time. It was the late 60s, and he was only reacting to a dearth of decent left-handed guitars, but Jimi's iconic compromise subtly altered the feel and sound of his Strats. The tension in his low E, A and D strings increased, making it easier to tune down to Jimi's favoured Eb, while the high E and B became easier to bend. The angle of his bridge pickup was reversed, too, influencing the guitar's tone. It's these details that Fender has replicated with its new Mexican- built Jimi Hendrix Stratocaster. "Our bridge unit is bright and bold yet never shrill, even with the amp's gain whacked right up." Moving on, the non-reversed chrome 'Synchronized' vibrato unit stands guard over a trio of American Vintage '65 single-coil pickups, with the bridge unit reverse-angled like Jimi's. Some of us shudder at reverse headstocks and the memories of bad hair metal, all-satin spandex and conspicuously placed root vegetables associated with them. Joking aside, flipping the head makes it tougher to reach the tuners, especially the low E. 'Ergonomics', they call that. Annoying is another good word for it. The sacrifice better be worth it. Fortunately, this guitar is a dream to play. The action is set low - with a set of 0.010 to 0.046 strings - yet there's no danger of any buzzing or choking for those with a light touch. That said, the heavy-handed might want to crank the string height up a notch. The increased tension in the bottom strings, most noticeably the low E, gives this guitar way more spank than a regular Strat, and that tonal angled bridge pickup. 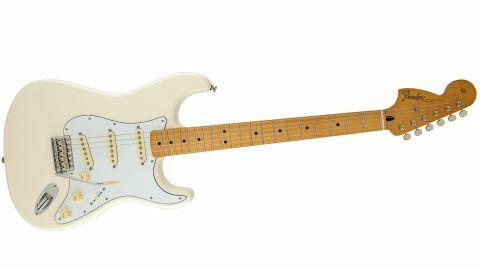 The single coil's bass-side polepieces sit closer to bridge saddles than on a standard right-handed Strat, which adds some serious twang to the lower strings clean. Dropping in some overdrive gives bottom- string riffs a huge amount of presence, and a staggering level of sustain. Conversely, the treble side of the pickup is further away from the saddles than it should be, which adds a little sweetness to the thinner strings. The Fender single coil has popped up Forrest Gump-style throughout the past 60 years of music history, and these American Vintage '65 pickups are some of the best examples we've had the pleasure to amplify. Our bridge unit is bright and bold yet never shrill, even with the amp's gain whacked right up. The classic 'in-between' sounds are so iconically glassy, you can almost smell the Windolene. The real star, however, is the middle pickup. Run solo, it produces a thick addictive bark that works great for clean and lightly overdriven rhythm parts. While some have grumbled, we're glad the vibrato arm position wasn't reversed. Hendrix-mad Stevie Ray Vaughan was a fan of the modification, but we reckon it works best where it is. As for those harder-to-reach tuners, it's a small price to pay for the tonal treasure. Besides, this Strat never lost its tuning once, and we played it a lot. Knowing how George Best laced up his football boots won't make you a genius on the pitch, and even this guitar's smart tweaks won't magically transform you into Jimi Hendrix. But don't dismiss this latest repackage of a 61-year-old design as a cynical marketing exercise.